When is a model more than just a pretty face? There are a couple of schools of thought among the marketers of professional services. On the one hand, there are those who believe that professionals sell themselves – well, the relationship with them – and the warm experience that doing business with them provokes. The other school holds that we should turn ourselves into products as a product is, they argue, easier to sell than the feelings that one person provokes in another. You will probably know which school I fall into, given that my website tries to convey something of my personality, that my business is simply named “Graham Wilson Ltd”, and the current iteration of my strapline being “Working behind the scenes helping leaders to achieve more than they ever dreamt they could” – which describes what I do rather than using a product name. There have been times when I have been urged to productise, and I’ll play with the idea, but usually find that it doesn’t work for me. Probably the last time was about three years ago when I created a six-session package of leadership mentoring called “Conversations with Leaders” in response to a request from a particular company. Another form that this productisation takes, among the professional services sector, is to create a ‘model’ and promote it. By the way, have I told you about my leadership development model? It’s called TROI (TM). It’s widely applicable and encourages leaders to explore more avenues before implementing strategic actions. The letters in the acronym stand for Thought, Reflection, Observation, Intervention. The idea is simple but, of course, the application is profound. The thought phase involves having a thought. These thoughts themselves are the essence of good leadership – a leader who doesn’t have thoughts is a bit of a damp squib really. Some thoughts will be good thoughts and some will be bad ones, but having thoughts is important. I have developed, over the years, many very successful (naturally) tools to help the thought process and on another occasion I will write about some of these. I digress slightly by explaining TROI (TM), but one of these days I will get around to writing a book about it, along with a number of practical tools, such as a pack of 52 playing cards that you can use to help with the Intervention phase. You see, timing is crucial in any leaders’ role. Intervene too soon and you run the risk of destroying everything; intervene too late and you could have missed your opportunity. There’s a Windows XP bundled version of the cards that you can use, but I often suggest to leaders that they are better using the more traditional manual tool. By distracting yourself in this manner it is possible to ensure that you don’t suffer from premature intervention. As I said in another blog recently, I freely admit, that in my naïve youth, I did create a couple of these models myself for real. Today though, I am generally critical of them. Why? Well, firstly, in my experience they rarely have any science behind them. They are a simple representation of some basic idea that will never be validated because to do so would be impossible, the author lacks the academic rigour to do so, and no-one would fund them to either. Secondly, their authors have an inflated perception of the importance and impact of the model often making quite ridiculous claims on their behalf. Along with this exaggerated sense of value, their authors often try to limit the number of people who can adopt the model – by trademarking, copyrighting, or registering the name, then launching some kind of licensing scheme through which interested parties can only be approved to use the model with appropriate training. Incidentally, the TROI (TM) masterclass will be launched in January and bookings are already being taken – our webshop is still under development, so a transfer of $1000 non-refundable deposit to my PayPal account will do fine. The venue will probably be the US CoastGuard vessel, Enterprise, which through its numerous international missions, has perfect facilities for experiential learning in the leadership field. Now, from time-to-time, an author (usually an academic) does publish something that has real predictive value and is not simply a method of categorising observable phenomena. Once published, the paper or book is reveiwed by peers and subsequently refined. This process may go on for years before a wider audience begins to hear of it. They may be tempted to commercialise it (ie productise it) by launching tools, instruments, training events, grades of qualifications, and so on. But usually, their ego is not sufficiently tied to it and they allow someone else to do this if they really want to. Often, commercialised ‘products’ can be seen to be thinly disguised versions of something else that has been in the public domain for some time, usually the outcome of the work of someone whose personal values were altruistic rather than avaricious. I am not saying that genuine discoveries don’t occur from time-to-time, even amongst management consultants, but I am suggesting that a ‘product’ that lacks academic rigour, has little predictive power, can’t be falsified, is deliberately simplified [‘dumbed down’] to make it learnable, and is based on someone else’s work, has little more to offer than some quack cure-all from a Spaghetti Western. Does it have a body of academic knowledge behind it? Is that body the author’s own or, at least, are the originators openly acknowledged? Can it be used not simply to classify but genuinely to predict future events? Can we find settings where it does not apply? If there are limits to its application, does the author openly acknowledge these? Mind Mapping or Concept Mapping? Back in the 1970s, a British author, Tony Buzan, published a book called “Use Your Head” in which he proposed a method of note-taking which he called Mind Mapping(TM). These continue to be promoted by Buzan; there are books, DVDs, tools, software and licensed instructor training courses. What Buzan has not widely mentioned is that the generic form on which his idea was based, ‘concept maps’, have been used for centuries in learning, information gathering, memory development, visual thinking, and problem solving by educators, engineers, psychologists, and others. Some of the earliest examples were developed by Porphyry of Tyros, in the 3rd century AD, as he graphically portrayed the work of Aristotle. Philosopher Ramon Llull (1235 – 1315) also used concept (or mind) maps. The ‘semantic network’ was developed in the late 1950s as a theory to understand human learning and it was developed into mind maps by Allan Collins and M. Ross Quillian during the early 1960s. If anyone was to be described as the ‘father of mindmaps’ it would be Collins or perhaps Quillian, both of whom continue to contribute to academic research in the cognitive psychology field and whose work is really coming of age now with the growth in importance of semantic networks in internet searching. However, Buzan claims to have invented modern mind mapping, apparently ‘inspired’ by science fiction novels, such as those of Robert Heinlein and AE van Vogt. When compared with the concept map (as developed by learning experts in the 1970s) a mind map is simply a radial form with just one central key word. Fierce Conversations or Person-Centred Counselling? In the 1990s, Susan Scott, published a book entitled “Fierce Conversations”. It has been transformed into a slick marketing operation (Fierce (TM) Inc) with… tools, licenced training, etc. No-one would deny that it’s a clever marketing gimmick to rebrand ‘flower arranging for senior managers’ as ‘aligned stalking’. However, when you read the book, you might be a little surprised to discover that it has a striking resemblance to the work of the internationally acclaimed psychotherapist, Carl Rogers, whose approach was known as “person centred” and the attitude underlying it was “unconditional positive regard”. “We are not therapists…”, Scott proclaims, but the person whose work she has commercialised most certainly was. Back in the 1960s, Paul Hersey and Ken Blanchard wrote a book called the Management of Organizational Behaviour, in which they postulated a model of leadership that broke away from the one style suits all and instead recommended different styles to suit different situations. The ‘situations’ were determined by the development level of the person being led – whether they were technically savvy or not and whether they were confident in their abilities or not. This was ground-breaking at the time. Other models did not look at the individual but at the circumstances (for example, leadership in war, in factories, in shops and so on). Of course, a criticism of their work might be that it assumes only one category of leader and yet four categories of follower, but it depended on its simplicity to be used and besides few leaders would like to be told that they somehow fell short of perfection. The Hersey-Blanchard academic collaboration has endured and their book is in its 9th edition. They both developed spin-offs – Hersey and his “Situational Leader” (SL) products and Blanchard and his “One Minute Manager” series. Both have produced licenced products and training and have seemingly been successful at it, but their core is their academic research and it’s robustness. There have been times when new research has led them to adjust the approach and while this has often merely affected the odd word or two nevertheless their products have not become stale. Back in 1969, a Swiss-born Psychiatrist, Elisabeth Kubler-Ross, published a book, “On Death and Dying” in which she put forward a model of the stages through which an individual passes when they are experiencing the loss of someone. Known today as the Kubler-Ross model of the Five Stages of Grief it has been almost universally adopted by professionals concerned with loss, not simply through death but jobs, divorce, financial security, even organisational change. Kubler-Ross had plenty of opportunity to commercialise her model, but she did not. Her interest lay in providing for those whose lives were to end, and in 1994 at the age of 68, her home and possessions were lost when arsonists destroyed them to prevent her from establishing a hospice for babies dying of AIDs in Virginia. She died without commercial gain, but her legacy is her work, her impact, and her model. And finally, lest anyone should think I was serious… More information on the TROI model of reflective leadership can be found [HERE]. I’d love to find a graphical example of Ross and Quillan’s concept maps. The earliest concept maps I’ve found from this stable are the work of Novak, Cañas et al. Ross and Quillan’s diagrams seem closer to the Tree of Porphyry, with added “crow’s feet” to list some attributes of each concept. 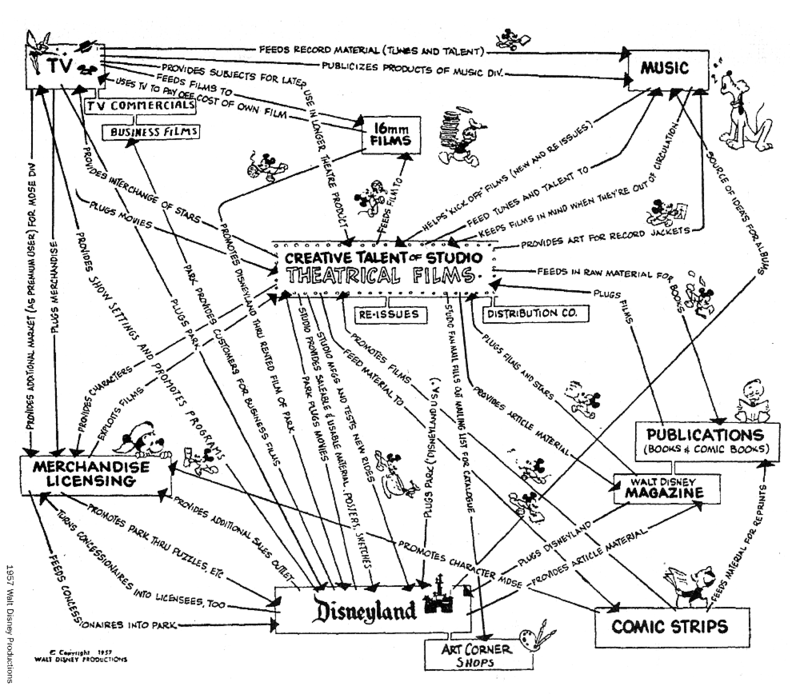 http://dukemedia.com/wp-content/uploads/2008/08/walt-disney-mind-map-reuse.png It is also a far-sighted piece of business thinking.